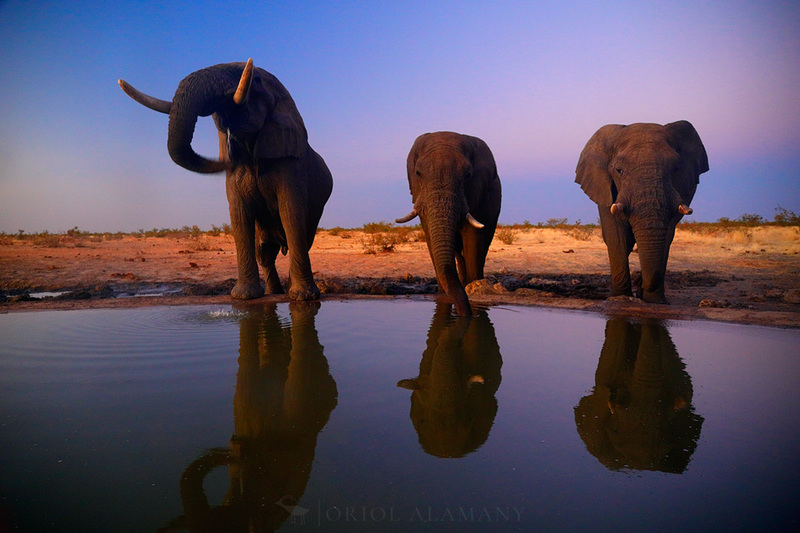 African Bush Elephants (Loxodonta africana) drinking water at twilight, Namibia. On my recent trip to Namibia, my plan was to do a photo story on the desert elephants of the Kaokoveld. But an unexpected problem with the vehicle we had rented made us desist from entering alone in that remote area.So I had to improvise and we moved to the less extreme Etosha area, where we stayed photographing for a couple of weeks. As an alternative I focused on the huge elephants of this national park, famous for being the largest in Africa: adult bulls weight around 5,500 and 6,000 kg. Around 1880s, after the arrival of the western explorers, the elephants were decimated until no one was left in the area. But today the population has recovered to reach 2,500.